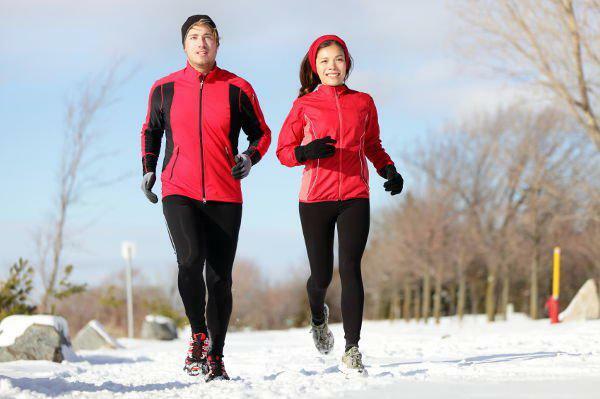 It’s been a chilly winter in the U.S., but it’s up to us to find a way to beat the chill and stay active. t Suddenly, the term “polar vortex” is everywhere you turn: on the radio, on the internet and on TV news reports. If the mercury on your thermometer is dipping way below normal, try these five fitness chill-busters. t If heading into the great outdoors seems like just too much, then fitting in exercise can be challenging. Thankfully, the digital age has enabled us to access all sorts of information at our fingertips, and fitness information is no exception. Download some apps that have easy, do-anywhere workouts and you can sneak in some cardio, arm or core workouts in the comfort of your own home. t It may seem daunting when the air is cold and the wind is howling, but in most conditions, it is still possible to layer and bundle up to get some outdoor activity. Head to your local running store for cold-weather gear or piece together layers that you have in your dresser already. Long pants, two shirts, a jacket, a hat and gloves are all you need for most temperatures. Add some earmuffs for extra warmth and head outside. Once you get moving, you’ll warm up quickly, and you’ll feel great afterward. t If the outdoor temperature is beneath your threshold for outdoor running, then running on a treadmill is the logical indoor alternative. But what do you do if you don’t have access to a treadmill? Call gyms and fitness centers in your area and ask about getting a visitor’s pass. It may involve getting a sales pitch or paying a guest fee, but you’ll have plenty of machines to choose from, and you can file away the information about the gym in case you decide to join in future. And you never know, you just might find that you enjoy it there. t You don’t need special equipment or instruction to give your body some attention with a good stretch. Find a space on your carpet (furry cats not included) and feel your body’s aches and pains disappear as you gently stretch and unwind your muscles. Starting the day with stretching can boost your mood and help keep your posture aligned throughout the day. t Having a friend to exercise with can make the difference between getting it done and skipping it. Meet a friend at an indoor place with space to walk, stairs to climb or an area to do a quick interval workout. Or invite her over to join you for a workout DVD. Having a partner in fitness can also give you a few cold-weather laughs and great memories, especially if you share a warm drink after the workout is done. t Finding the motivation to work out on a day when you want to hide beneath the covers can be daunting, but once you get moving, you will warm right up. And the great feeling you’ll have after the workout will last with you throughout the day.